Guatemala has been a fantastic experience, a real gem of a country. we didn´t really know what to expect, but it turned out to be a wonderful country. Here, we were introduced to the wonders of the chicken bus public transport system. 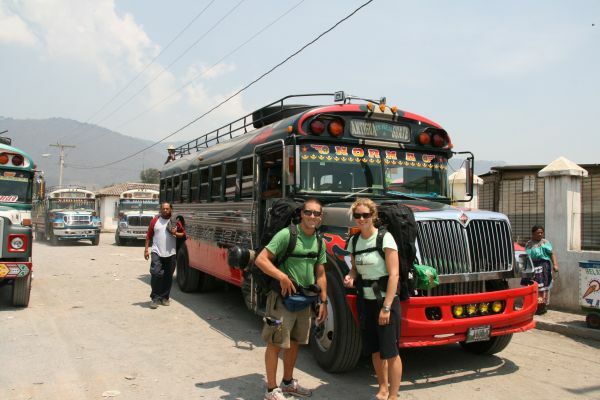 The chicken buses are old US school buses, which are bought by middle men and shipped to Guatemala (and other Central American countries). Once here, they are bought by private transport agents. They are fitted out with bigger wheels and a stronger engine, extra seats are added, luggage racks, safety rails, a roof rack and access ladders are fitted, and the whole thing is painted with bright colours and finished with flashing lights. 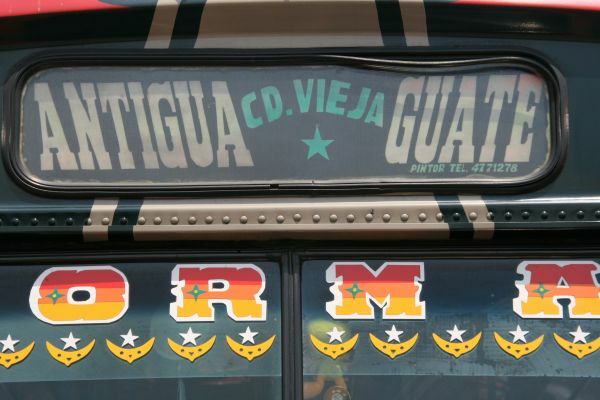 The result is a mean transport machine, which carries many more Guatemalans than American children in its past life! The system works extremely well. 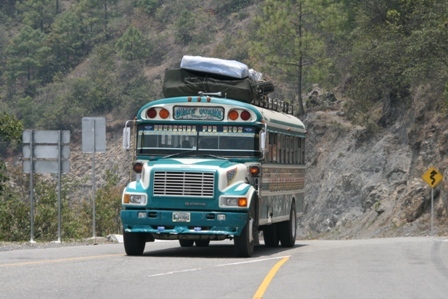 Usually, several companies compete on each route. The consequence of this is that the driver and conductor on each bus become ultra-competitive with the other buses. The name of the game is speed – and this includes hoisting passengers and their baggage on at full speed, or flinging them off again. The conductor spends a lot of time on the roof during the trip. Loud music of the drivers taste entertains the masses, and attempts to blind the passengers from the crazy overtaking moves! Traders jump on and off buses all the time. Some sell icecream, sweets, nuts or drinks. This can be handy if peckish! Others are walking advertisements. They get on, give their spiel and hope to sell the newest magic vitamin supplement or some DVDs. Guatemala has been our cheapest country so far, Cathal has calculated that our budget was 50 euro a day (not including our souvenir purchases. Accomodation in a double room averaged around 12-15 euro per night. Souvenirs is another story! There are so many beautiful traditional cloths in Guatemala. 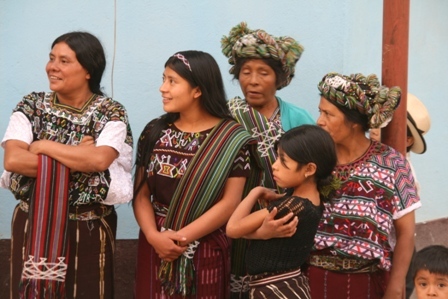 We were very taken with the women´s ¨huipiles¨, or blouses, which are woven from beautifully coloured cloth. They wear these with long woven skirts, and colourful belts. Each village in each area has its signature designs. The women don´t stick to this strictly, but for events they will all tog out in their village gear. The men wear western clothing mostly. This goes back to the civil war. During that time they didn´t want to be recognised as being from a particular place, as it may endanger their life. We have weighed ourselves down with about 15 extra kilos of bedspreads, cushion covers and a couple of handbags! Thankfully we can ship it all home from the states in 2 weeks time! We have discovered some local foods that we like. Cathal is particularly partial to friholes or refried beans, and asks for them whenever possible. Guatemalans are very fond of licuados, which are drinks made from blended fruit with milk or water. They also make excellent lemonade, with sparking water. Other treats are cashew nuts, sprinkled with salt, pepper, chilli powder and lime juice. They also eat mango this way. You will see many stalls around town selling fresh orange juice in a bag, and bags of sliced mango and papaya. Beers are widely available, if a bit limited. The local Gallo or Brahva are a bit like Budweiser, but the dark beer Moza is a good thirst quencher.